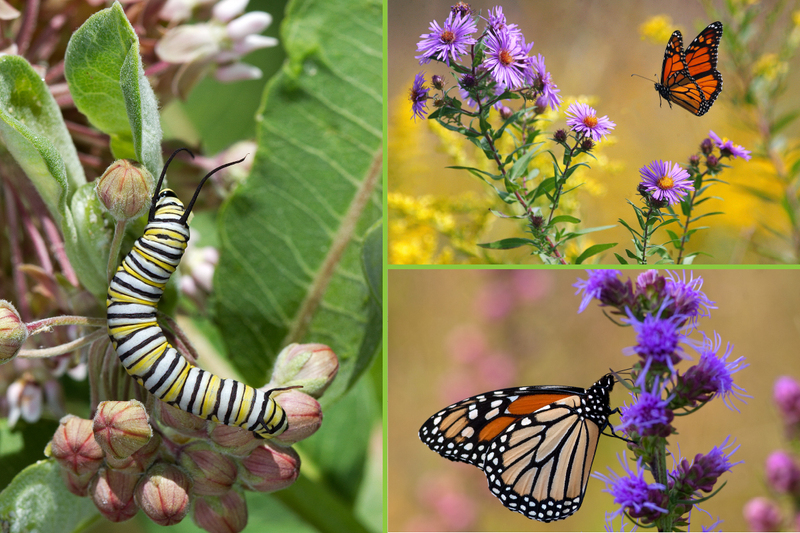 Monarch caterpillars feed exclusively on milkweeds, while the adult butterflies consume the nectar of milkweeds and many other flowering species. 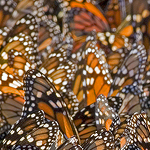 CHAMPAIGN, Ill. — Steep declines in the number of monarch butterflies reaching their wintering grounds in Mexico are not fully explained by fewer milkweeds in the northern part of their range, researchers report in a new study. The research, published in the journal BioScience, reviews decades of studies of monarchs and includes an in-depth analysis of milkweed populations in Illinois, a state at the heart of the butterflies’ summer range. 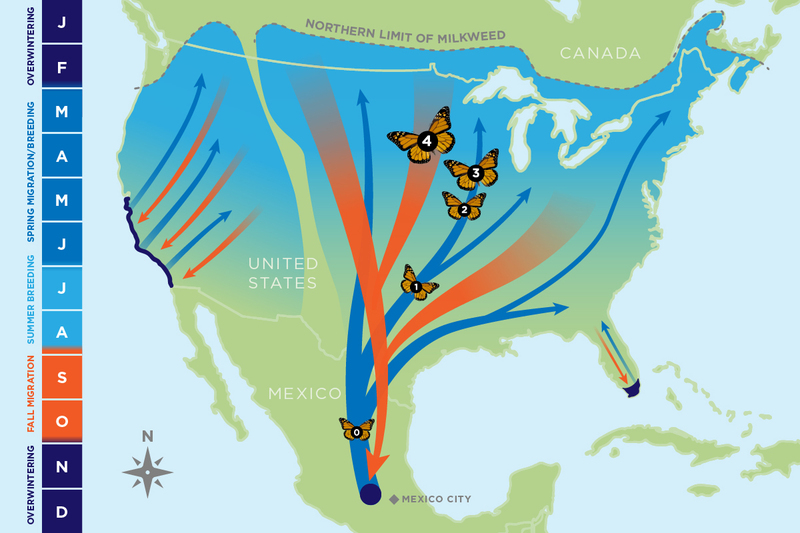 Over several generations in their summer range, monarchs migrate north to breed – but only one generation makes the return trip to their wintering grounds in Mexico. It takes a few generations of monarchs to make the trip north from Mexico to the Midwestern United States and Canada where they summer, but the return trip is a long one. 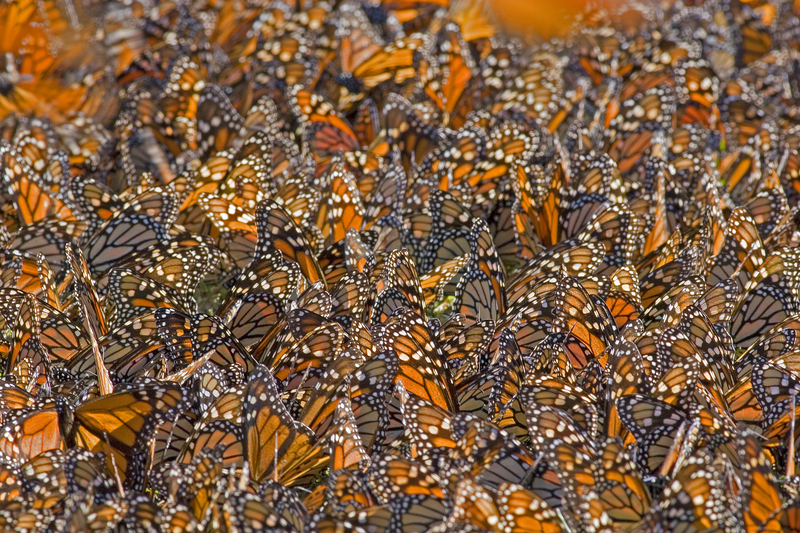 A single generation travels back to the monarchs’ wintering ground in Michoacan – flying up to 2,500 miles. Monarch butterfly populations in Mexico dropped from a high of 682 million in 1997 to a recent low of 42 million in 2015. Monarch numbers in Mexico have dropped from a high of 682 million in 1997 to a recent low of 42 million in 2015. Researchers are struggling to understand what is driving the decline. A popular hypothesis is that the loss of milkweeds – the only plants on which monarch larvae can feed – is to blame. Milkweed losses are tied to the use of herbicide-resistant crops, a practice that began in the late 1990s and allows farmers to apply nonselective herbicides to their fields. Milkweeds are susceptible to glyphosate, the most common herbicide used to protect those crops from weeds. Illinois Natural History Survey plant ecologist Greg Spyreas and his colleagues found that the loss of milkweeds on agricultural land in the Midwest does not fully explain declines of monarchs in the southernmost part of their range. The new analysis confirmed that milkweed numbers have dropped by about 95 percent in cropland in Illinois over the last 20 years, said Illinois Natural History Survey plant ecologists Greg Spyreas and David Zaya, who conducted the study with research ecologist Ian Pearse, now at the U.S. Geological Survey Fort Collins (Colorado) Science Center. The INHS is a division of the Prairie Research Institute at the University of Illinois. Researchers evaluated populations of several types of milkweeds growing in Illinois, including these three. Milkweeds in natural areas also have declined in the past two decades, primarily as a result of the conversion of pastures and other marginal sites to cropland, Zaya said. But the overall drop in the number of milkweeds in Illinois – roughly 50 percent, the researchers found – is not as large as the huge decline in monarch butterflies making it back to Mexico. Other lines of evidence challenge the notion that milkweeds are the sole cause of monarch declines, the researchers said. Despite smaller numbers leaving Mexico each spring, once they get to Illinois, the monarchs seem to quickly rebound. 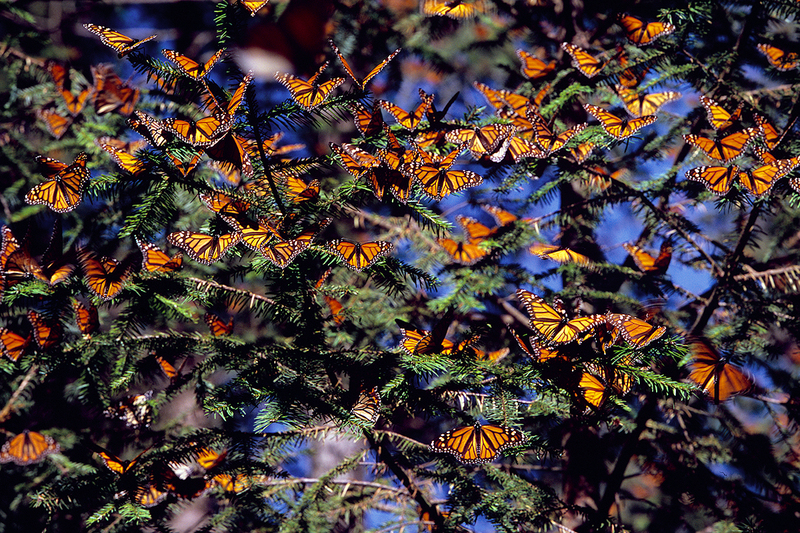 Monarch populations in their wintering grounds in Michoacan, Mexico, are in precipitous decline. “There are fluctuations in the number of monarchs in the Midwest year to year, but studies suggest there is not an overall decline,” Zaya said. “Conservation efforts also need to look beyond milkweed populations to other possible causes of monarch declines,” he said. Habitat loss, disease, parasites and climate change all could be playing a role. "While boosting milkweed numbers can be part of the solution, I don't think it is the entire solution." Because the population crashes tend to occur on the way to Mexico, the researchers think a lack of late-flowering nectar sources along the route also may be a significant contributor. “This is what we’ve found in other extinctions of migratory animals in North America and elsewhere,” Zaya said. “It’s multiple things coming together to cause this problem. And I think this is along the same lines." The Illinois Department of Natural Resources supported this research. To reach David Zaya, call 217-244-1946; email dzaya1@illinois.edu. 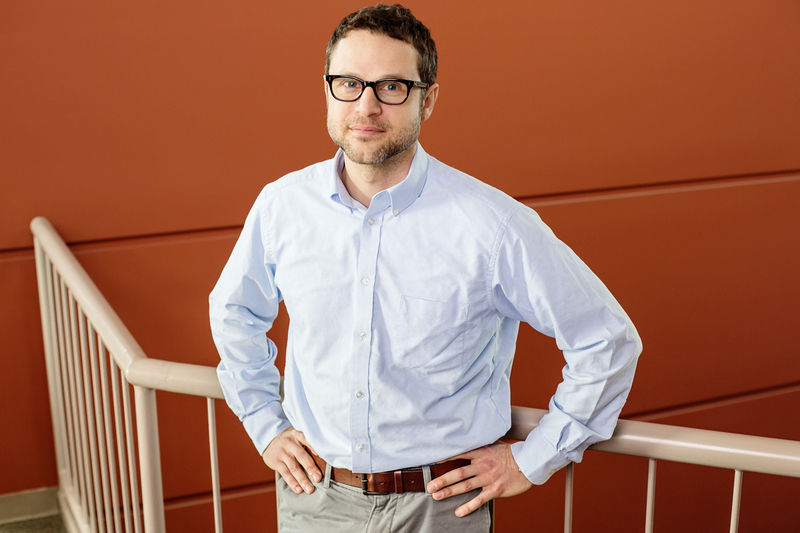 To reach Greg Spyreas, call 217-300-4023; email spyreas@illinois.edu. To reach Ian Pearse, call 970-226-9145; email ipearse@usgs.gov. The paper “Long-term trends in Midwestern milkweed abundances and their relevance to monarch butterfly declines” is available online and from the U. of I. News Bureau. The dataset associated with the paper is available online from the Illinois Data Bank.